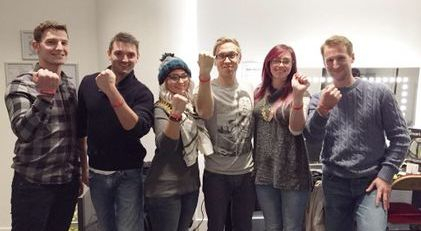 14.12.14 Comedian Russell Howard shows his support! Our fantastic auction winners from our first ever Noah's Big Charity Ball held back in June, went to see Russell Howard's Wonderbox Tour live at the London O2 and got to meet the man himself backstage before the show! Everyone (including Russell) wearing their wristbands in support of NBC.....AWESOME!! Thank you to everyone involved with special mention to Dave Cannon! Ashton & Charters have done it again, supporting NBC at this years Xmas Market. 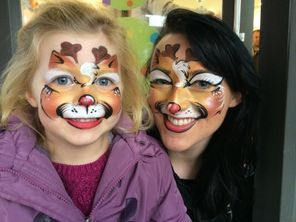 Face painting, mulled wine and mince pies were the order of the day. Helping us raise money and awareness! Thank you to all the team! 02.12.14 Virgin Money London Marathon Places!! In the space of 2 days we have been lucky enough to secure 2 places for the 2015 VMLM. We are looking for runners to fund raise for us and be part of #TeamNoah! A Minimum commitment of fundraising of £1500 for each place. If you are interested in running this epic event, please contact us. We have joined forces with 'Give as you Live' and you can help Noah's Big Charity, just by shopping online! Shop with your favourite stores and raise a donation for Noah's Big Charity - all without charging you a penny more. You can get started, raising money for Noah's Big Charity today by clicking the image above. They did it! 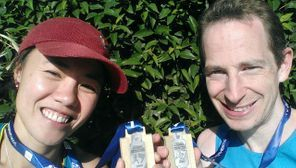 Congratulations to MaysZe & Dr.James who completed the Athens Marathon for #TeamNoah! Fantastic effort and some brilliant funds raised for NICU! Well the NO rain dance worked and our energetic #TeamNoah blew the cobwebs away completing the Billericay 10K. well organised event and great turn out! 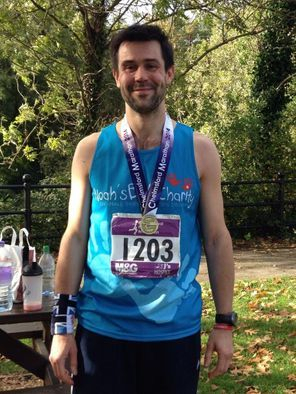 A huge thank you and congratulations to Alan Packard who completed the Chelmsford Parks Marathon in 3hrs 49m, raising £800 with match funding from Barclays! Great effort. Alicia's Obedience Dog Training have supported us for the second year running, making us one of their charities for their recent and very popular Annual Dog Show. Thanks to Alicia over £200 was raised! Such great local support! Congratulations and thanks to Lee Powell who completed this epic 245 mile cycle over three days, supporting NBC. Battling head winds, sore legs and carrying all his own kit, Lee's efforts have raised over £500! Awesome!! New Beginnings Day Nursery Romford have stepped up again and for the second year in a row and their 3rd event have raised a fantastic £350, with a sponsored toddle around a local park. thank you to the continued hard work of their children staff, friends and family! Thank you to Waitrose and the residents of Billericay, who by using their green tokens raised £449.00 in July! The local support is heart warming! We are delighted to announce the safe arrival of baby Jacob (Noah's little brother)! Lydia & Richard are delighted and would like to thank everybody for their kind wishes. 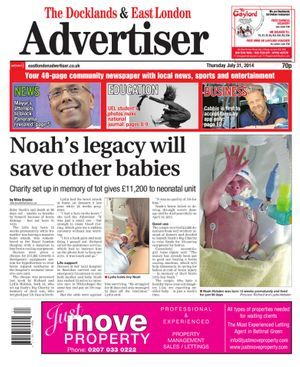 Our first grant to NICU at the Royal London has put us on the front page of the Docklands and East London Advertiser! Hopefully we can grow some more support! 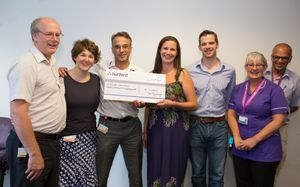 One of our biggest days today for NBC as visited The Royal London NICU to present a cheque for £11,200 to fund a Criticool Machine, a key piece of equipment for Ward 8D NICU! This is what it's all for. Thank you to everyone who has helped us get this far! A sincere thank you to Gary Tucker, a serving member of the Electrical & Mechanical Engineers based at Borden, who recently attended a reunion dinner at Borden where the attendees held a collection and raised £380 for NBC! Great job! Emerson Crane Hire held their family fun day on Sunday and managed to raise an incredible £1200 for NBC before the heavens opened up! thank you all who supported the event, we even heard that two little prems made an appearance as well! Scott, Wes and Brett completed the 52 mile route in the blistering sunshine together with 5000 others! Together they have raised an amazing £900 so far. Thank you chaps! Team Noah was joined by Rick, Andy and Rich to get another great outing for the bikes! A tremendous well done to Jo Fowler supported by husband Ben, for completing the British London 10K! Jo raised a wapping £575 plus gift aid! Big thank you to Danica Foreman for all her help at the Fete. We raised some good local awareness and got quite a few wristbands out there carrying the message! The kind people of the Freemason Spero Lodge continued their support of NBC with a very successful Golf Day today. 44 Golfers took part and somebody even managed to get the rain cancelled! A good deal of money raised and great event all round. This almost slipped us by, but the Yellow Advertiser ran another article on the charity just before the Capital to Coast event. Thank you YA for the support. We discovered today that NBC will be one of Waitrose Billericay's Charities in the 'green token' Charities Matter campaign for the month of July! Get your green token from the checkout and put it in our section of the collection box. the more tokens we get the more money Waitrose donate!! Congratulations to Alice the one woman Team Noah who came 7th out of all the ladies who took part in the Cheltenham Challenge Marathon on Sunday! 15.06.14 Noah's Big Charity Ball 2014 makes an Impact!! With over 170 wonderfully glamorous guests our first ball has proved a roaring success, with a live auction, silent auction,raffle and games, we are truly humbled and grateful as we phenomenally raised in excess of £15,000.00!!!! Seven of Team Noah's London to Brighton Cycle team gave their new sponsored jerseys a run in and took to the roads of Thurrock in the Thurrock Marathon Bike Ride today and in the 25deg heat put in a cracking performance. Bring on the big one 2 weeks to go! Scott Wallis & sister (and Team Noah veteran) Sam took on the Southend Half battling the heat they clocked up admirable times coming in well under the 2hour mark, with some great funds raised. Thank you Scott! and well done not tripping over the string hanging out of your shorts... ha ha! 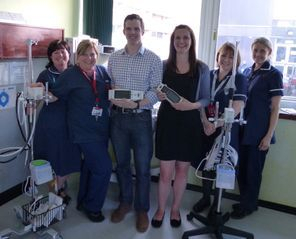 FANTASTIC Our first funded equipment arrived on Basildon NICU today!! 5 pieces of equipment including two Optiflow breathing machines.... Thank-you to everyone who has made this possible! Danica Fordham and the ladies of St Anne Line School completed the London Color Run today at Wembley Park, under the glorious sunny conditions they finished the 5k course complete with make overs! £550 raise so far! Well done Ladies! Rich Brass our team Noah superman took on the Enduroman double iron man challenge. Rich was leading out of the water (3.8mile swim) got on his bike for the 232mile ride, but during this stage suffered a bad eye injury and had to retire. Still our superman and we know he must be gutted but will be back!!! After 9 hard days cycling the JOGLE Team arrived in Land's End! A phenomenal effort from Angela, James and Jason. Our thanks to them for a tremendous effort! Included a trip to Wales, going great with two days left and just over £1600 raised so far! Jackie Cayless supports the JOGLE team by holding a week long silence at work and raising over £400! Fantastic effort, although from the photo it looks like she wasn't taking any chances!! Our thanks to Peter Emptage of Emptage Architects as sponsored £200 to our Noah's Big Charity Ball which is only just over 2 weeks away!! 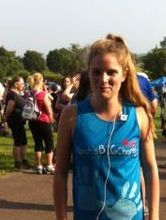 Ailsa Lawrie is taking on the Edinburgh Marathon today! UPDATE... Ailsa finished in a fantastic 4hrs 20mins! Quality Scot! Matt Townsend starts his 85mile trek on the Coast to Coast trail! 01.05.14 - Wristbands have arrived! Noah's BIG Charity wristbands arrived in today! They'll be on sale soon, so you can show your support! 10.05.14 - Hot of the drawing board our Cycling Jersey mock-up! Harry's Bar have become our latest cycling Jersey sponsors, as well as providing a meal for 2 at their restaurant as a prize for our ball! Local support is brilliant! Chris and the team at Yellow Jersey Cycles have sponsored our cycling teams! See the Nathan in the shop sporting one of our Jerseys soon! Ashton & Charter Estate Agents have joined our Jersey sponsors and have committed to supporting the charity moving forward with other events and raising awareness! Fantastic support. Masons of Billericay are supporting our cycling teams for John O'Groats to Lands End and London to Brighton as a jersey sponsor. Great local support possibly helping in the future as well. Hopefully more sponsors to follow. 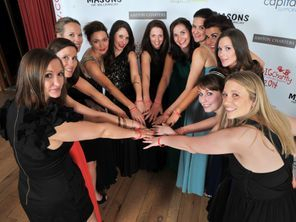 These renowned jewellers have donated an earring and necklace set of jewellery to our ball! Great local support, much appreciated! 03.05.14 - Fantastic Lodge Support! Thank you to Spero Lodge Freemasons who made us one of their charities of the year earlier this year, we've just received a £500 donation! Brilliant. 01.05.14 - Teachers take on Color run London! Danica Fordham and 5 others from St Anne Line Infant School are fundraising for Noah's by taking on the Color Run 5k London, in Wembley Park on 1st June! ComeOntheTeachers! 27.04.14 - Only 7 Weeks until the Ball! Not long now until our first ever Noah's Big Charity Ball! The venue have told us that we can fit a couple more tables in so we have 20 more places available. Please get in contact if you would like to come. We also still have company sponsorship packages available! 27.04.14 - Bikes ready only 8 weeks to go! Until our 21 strong Team Noah take on the Capital to Coast London to Brighton bike ride, we still need a jersey sponsor(s), so if you can help please get in touch! 25.04.14 - 1st NBC Golf Day a Success! A fantastic group of guys took to the course at Romford Golf Club and enjoyed the ever unpredictable British weather as they basked in glorious sunshine all afternoon! Great sportsmanship and banter. Together with a raffle and some kind donations the event raised over £1100! Roll on next year as the NBC Golf Day looks set to become an annual event. The amazing Rich Brass is taking on a double Iron Man event on 31st May for Noah's Big Charity! The event is so long it will take 30 straight ours to complete and consists of a 7.6km (4.8 mile) swim, 360km (224 mile) Bike Ride followed by a 84.4km (52.2 mile) Run. Stamina isn't the word! Superstar is though! See our donate page for details. 14.04.14 - Virgin London Marathon Done! What superstars both our Team Noah members and our hoard of supporters who travelled around the route to shout and cheer. Fantastic day everyone made it around in the blistering heat. Jamie, even place 486th out of the 35,000 odd runners! Great effort with £4,500 raised by the team so far! Thank you to you all. 12.04.14 - One More Day! Noah, the little man inspiring us and many passed away a year ago today! Missed immeasurably, I'm sure he knows the fantastic work being done in his name! Twinkle little star! 06.04.14 - Only one week to go! We are happy to announce that our first grant for equipment is being issued on Monday, funding the purchase of 5 pieces of life saving equipment for Basildon's Neonatal Intensive Care Unit! Noah's Big Charity IS making a difference! Thank you to all of our supporters and fundraisers... your all fantastic! 13.03.14 - Read All About it! So we made the front page of the Yellow Advertiser! 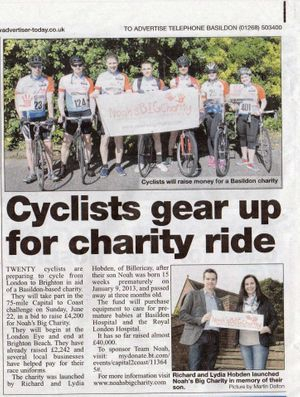 Great exposure for the Charity and hopefully attract more local support! Names now on tops, Tash, Rick and Rich have trained hard and are ready for the big day! 26.03.14 - Not long now! Our first ever Team Noah taking on the Virgin London Marathon have only 18 days of waiting left! Good luck to Sarah, Jamie, Tash, Rick & Rich! Thank you for taking on the challenge on April 13th and undertaking some fantastic fundraising! Today we discovered that Noah's Big Charity has been made the official Charity of the Year with Hermes Fund Managers. A huge thank you to all the staff who voted and made this possible. Brilliant news! With only one table remaining for the first Noah's Big Charity Ball, The Yellow Advertiser are running an article on the Charity and the forthcoming Ball in the next week or two, hopefully this will give a boost to corporate sponsorship. Thank you to Laura Browning at Motorola solutions who donated a couple of hundred pounds worth of two-way radio equipment for our upcoming raffles! Great support! So Team Noah keeps growing with 2 more riders joining this week. We're now at 20 riders which is our biggest team by far to date! Exciting times! JERSEY SPONSOR(S) NEEDED - IF YOU CAN HELP PLEASE GET IN CONTACT. A picture is worth a thousand words, although I think one word summed it up......Tough! Well done (L-R) John, Rich & Rick! Who raised almost £500 for getting very very very cold, battered and bruised! Thank you to Kay, Steve & especially Nic, who have been able to provide us with 2 more places for the Virgin London Marathon 2014! This is fantastic because places are like gold dust and will mean a tremendous amount for the charity! Thanks to Rick, Tash and Rich for joining Sarah and Jamie and being our Marathon Team Noah! 26.01.14 - Tough Guy Completed!! 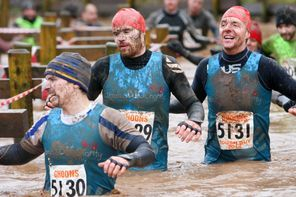 Our Team Noah, John, Rick and Richard, successfully completed the gruelling, obstacles, freezing cold lakes, mud, hills and rivers of Tough Guy UK in Wolverhampton, raising £400 in the process! Well done Tough Guys! We are delighted to announce that the Spero Lodge of Freemasons has kindly made us one of there designated charities for the coming year, with events already in the mix for raising funds. Many thanks for believing in our cause! We are in the midst of organising our Team Noah for this 75mile charity bike ride fund raiser with the team at Capital to Coast. Had a tremendous amount of interest in last few days as word has spread, so if you are up for the challenge please get in contact for what is sure to be an exciting day. One year ago today Noah started his adventure! From breaking nurses hearts to inspiring people he never met. It has been an emotional year, we thank you all for your continued support. Always our little star in the sky! New year has arrived, the festive period pies have taken their toll and Team Noah are due back in action for Tough Guy on 26th January.... not long to go now! Thanks to Katie Phillips and Laura Samuels we've received an additional spot in the London Marathon 2014. Tash Eggleton (friend of the charity) has happily accepted the spot and is currently training hard! Thank you all! This year has been one of the toughest our family have ever faced. The birth of Noah, our beautiful son, his fight, tenacity and personality, coupled with the compassion and humility of those who cared for him, as well as the many who showed their support, never actually meeting him, was truly inspirational. Noah's passing was our darkest hour, however from this empowered by our son, a light of hope has grown in intensity since, with the creation of Noah's Big Charity! We are proud to let everyone know that in the 6 months the charity has been active we have raised in-excess of £20,000, which will be going to our benefactors at the Royal London and Basildon hospitals in the new year! We as a family and as a charity thank you all for the tremendous support we have received, to our Team Noah members we thank you for your dedication and we wish one and all a very Happy New Year for 2014! Team Noah Dubai completed the Color Run and raised over £1600 whilst getting covered in paint. Awesome effort guys, thank you! Above: MaysZe & James after their superb efforts in Athens! 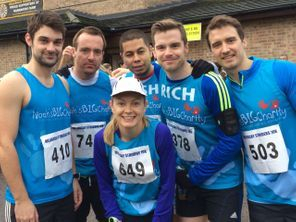 R-L: Sean, Jim, Sam, Tash, Rich & John all looking fresh before the 10K! Right. 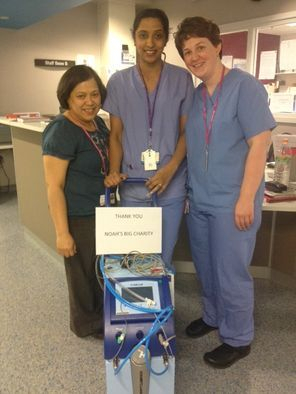 Jo, Swapna and Polly on Ward 8D at the Royal London with the shiny new Criticool machine!! Above. Alan with his Chelmsford Parks Marathon Medal, looking like he didn't even break a sweat! Above: Jo Fowler after completing her British London 10K and not looking out of breath at all! Right. Alice Pre-Race time at Cheltenham wearing the Noah's Vest with pride! The Team from MOM showing there support in fancy dress for the day! We think some them should go to work like this everyday! 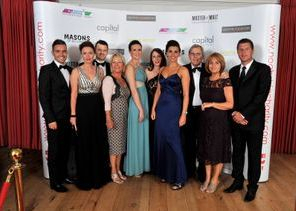 Black Tie and Glamorous gowns really brought added tot he flavour of the evening at the Charity Ball! Above: At Basildon NICU Ward (06.06.14) with the brand new equipment funded by NBC!! Angela, James & Jason triumphant at Lands End! Left: Ailsa Lawrie pre Edinburgh Marathon with a super fan! 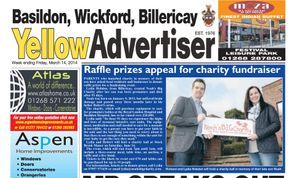 Lydia & Richard pictured on the front page of the Yellow Advertiser, outside Stock Brook Manor where Noah's Big Charity Ball will be held. Photo taken by Martin from The Yellow Advertiser. Lydia & Richard outside Stockbrook Manor, Billericay, where first Noah's Big Charity Ball will be held in June! A picture is worth a thousand words, although I think one word summed it up......Tough! Well done (L-R) John, Rich & Rick! (Above Left) Laura & Friend at the finish complete with a coating of paint. Yet more thanks to one of our biggest supporter Sarah King who with the support of her clients and trusty donation money box has raised £515. What a Christmas present! Huge thanks to all who helped and donated. Special congratulations to Sarah & Will on your special news! Well it was an arduous task but we have finally been given gift aid status by the good people at the HMRC. So we're led to believe that with appropriate signed declarations we can claim gift aid on donations already made, which will add up to quite a significant amount! Some of Team Noah who took part in the French Riviera Marathon have been fortunate enough to receive match funding from their employers. This funding looks set to push the FRM total to beyond £10K! Only 21 days until Team Noah Dubai take on the famous Color Run in Dubai. Good luck team! New Beginnings Noah's BIG Toddle have kept us busy, with donations still coming! At the last count these wonderful people had raised over £950.00..... how amazing! Visit our new page dedicated to the 'Little Adventurers' of the Neonatal Intensive Care Unit. Freddie was an incubator neighbour of Noah's at the Royal London and his parents have been kind enough to share their story, helping to raise awareness for Noah's Big Charity and the fantastic care Freddie received. 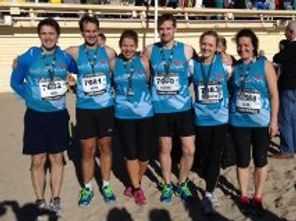 Team Noah who took on the French Riviera Marathon on Sunday 10th November all successfully completed the 26.2 miles! The team had a travelling support as well, so a big thank you to them also. Well done Team. Thanks to the tremendous support and donations received our team have raised over £7000 so far with donations still arriving! Come On The Team Noah! Following the Big Fun Run in Victoria Park in October, Lydia & Team Noah raised an incredible £1700! A special mention to Suzie and the guys at Office Shoes who contributed massively to this. thank you all. 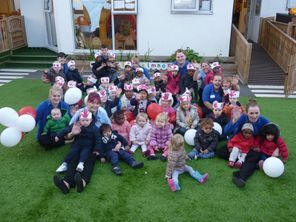 Got a great picture (Right) of the team and kids at New Beginnings Nursery Romford, following their fantastic Noah's Big Charity Toddle. Can't help but make you smile when you see their personalised hats with hand prints! Only 6 days until Team Noah take part in the French Riviera Marathon! Come On the Team Noah! 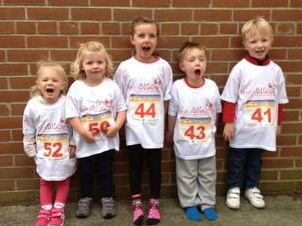 Following the Arise & Shine 1 Mile fun which our Mini Team Noah took part in back in September, we are proud to announce that our little runners raised a little over £450.00 for Noah's BIG Charity! What little stars and what fantastic support! Well done and thank you to everyone involved. We are happy to announce that following our recent charity registration, NBC have now joined 'My Donate', where all general and event donations are greatly received. The good people and proud supporters of Noah's Big Charity at New Beginning Day Nurseries, are hosting a special event tomorrow (24.10.13), fundraising for the charity! This is the first official NOAH'S BIG CHARITY TODDLE!! Children, staff and parents from the Romford nursery will be toddling through the local park from 2pm, complete with balloons and hand made hats with hand prints! Please show your support if you are in the area! Come on the Toddle! We have just received confirmation from the Charities Commission, who have confirmed that Noah's BIG Charity has achieved charitable status and has been entered onto the Register of Charities. Our Registered Charity Number is 1154272 ! Thank you to all who have helped reach this fantastic milestone in little more than 6 months. Come on the Team Noah! A massive congratulations to Team Noah and the star of the show Lydia aka SuperWife, for completing the Big Fun Run 5K, Victoria Park, London. Even the weather seemed to hold out for us, with a great turn out for the event. Big thanks to Suzy, Karen, Leah & John who all ran, plus the family and friends who came to support us. Special thanks to all those who sponsored those taking part, we'll update on the amounts raised shortly. The kind folk at New Beginnings Day Nurseries have pledged further support to NBC by announcing their sponsored 'Big Toddle' in aid of Noah's BIG Charity, being held on Thursday 24th October, setting off from their Romford Nursery! Thank you to you all! Six months gone and we still look to the stars to see you twinkle! Well it's nearly here, all of Lydia's training in recovery from the events of last January has built to the Big Fun Run 5K, Victoria Park, London. Lydia along with a team of friends and family will be running (yes running!) on Saturday 12th October at 11.00am. All support welcome!! Come on the SuperWife! To coincide with Lydia's run we had hoped to be up and running (excuse the pun) with Just Giving but a delay in the Charity registration process has put this on hold. However all is not lost as we have set up a 'Donate' Button above which allows donations via PayPal, please support Lydia and Team Noah by donating if you can. Congratulations to our very own Mini Team Noah who completed the Arise & Shine 1 Mile fun in Stock today raising money for the Charity! What little stars they are, watch out Mo Farah, there's some competition in development coming your way! A Huge thank you to Sarah King Hairdresser and her clients, who have together donated over £450! Shame we had to smash the donation pot to get to it though... ha ha! The venue has been booked and date set for the 14.06.14 for Noah's BIG Charity Ball. More information to follow. We're still growing and we've just gone past the 300 Likes mark! Thanks for the the continued support facebookers. A huge thank you to Joanna Wilkinson and all the guys at New Beginnings Day Nurseries, who along with the little ones who attend the nursery, took part in a toddle to the local park to raise funds for charity. They have kindly donated £600 to Noah's Big Charity.......Wow! Also, at their Romford nursery they have dedicated a garden growing area as 'Noah's Growing Area', to show children how plants and vegetables grow, how to take care of them and how precious they are. What fantastic people. Following the advice of some friends and trying to reach as many people as possible to raise awareness of the Charity, our aims and hopefully finding people who can help, we are now live on Twitter, @NoahsBigCharity. We've added a link at the bottom of the page along with the existing facebook and Tumblr links, as well as the follow button opposite. Please keep spreading the word and sharing the news about Noah's Big Charity. The more people who know about us, the more people who may be able to help! Thank you to all our facebook friends! Thanks to his wife, a good friend of ours and the Charity, Scott Fairley (of London 10K fame) was nominated to be a Hero of the Month, in the 'This is Your Essex' Magazine. Well deserved for Scott! Great article and fantastic coverage for Noah's Big Charity, featuring in its first official publication, reaching many homes in Essex. Thanks to Scott (His Wife Kylie) and the team at This is Your Essex. Visited Basildon NICU today, where Noah started his 91 day adventure! Thanks again to all the team there who gave us the opportunity of time with our little boy. Really positive feedback from the unit about the charity and how we might be able to help! Congratulations to 'Team Noah', all of the magnificent 7 completed the race in very very hot conditions..... What stars! Still waiting on a final count, but believe we raised in excess of £1000! Particular thanks to Scott, competing in his first race, he raised a substantial amount on his own! Please wish, Adele, Sarah, John, Keith, Scott & Rich, the first 'Team Noah' to hit the streets, for The British London 10K Run, Good Luck! If you happen to be near Green Park off of Piccadilly tommorrow, the race starts at 9:35am and all support is welcomed! Don't forget the suncream.... its going to be hot! As a result of the kind generosity of all who attended Noah's funeral we have raised almost £1,500.00, this puts us well on target to reach £5,000.00 which will offer us the opportunity to complete our application to become an official registered charity. (Above) Team Noah at The Big Fun Run, Victoria Park London.